In a large sealable container, mix the cider vinegar, white vinegar and sugar until sugar has dissolved. Mix in the ketchup, crushed red pepper, black pepper, paprika, onion powder, garlic, salt and cayenne pepper. Cover, and chill in the refrigerator. Prepare an outdoor grill to 325 degrees F.
In a small bowl, combine the salt, pepper and paprika. Season the pork shoulder on all sides. Place hickory chips on the coals or in a smoker box. When the chips begin to smoke, position the pork shoulder for indirect heat on the grill, skin side up. Cover. Smoke the pork until it becomes fall-off-the-bone tender at a minimum internal temperature of 195 degrees F, about 4-5 hours. Transfer the cooked pork to a cutting board. Tent the pork with foil, and allow to rest for 15 minutes. Discard skin, and pull the pork, discarding bones and fat. Transfer the pulled pork to a foil pan. Stir in enough of the sauce to keep the pork moist. Cover the pan with foil. Place on the grill to keep warm until ready to serve. In a large bowl, combine the cabbage and 1/2 cup of the sauce, tossing to mix well. 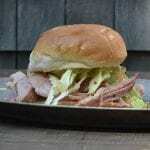 Pile a generous portion of the pork and cabbage on a hamburger bun. Spoon on additional sauce, and serve.